A pair of Tank Raised clowns nestle amongst the arms of a leather coral, Inside the 90-gallon reef tank at the Walnut St. Christian School in Williamsport, Pennsylvania. The Reef Conservation Society’s Tanks for Schools program was featured in the July/August 2013 issue of CORAL Magazine. This program was started at Williamsport High School in Pennsylvania under the leadership of Lawrence Flint, a Physics and Chemistry teacher at Williamsport as well as the Vice President of Education for the Reef Conservation Society. The society’s Tanks in Schools Program is growing rapidly and is now approaching 30 aquariums around the state. One of those tanks is not too far away from Williamsport. The Walnut Street Christian School in Avis, PA has about 160 students K -12 and is home to a 90-gallon reef tank. The two year old tank sits in the school’s lobby and is maintained by local RCS member Tony Beyer, who showed me the tank and shared how it came into existence. 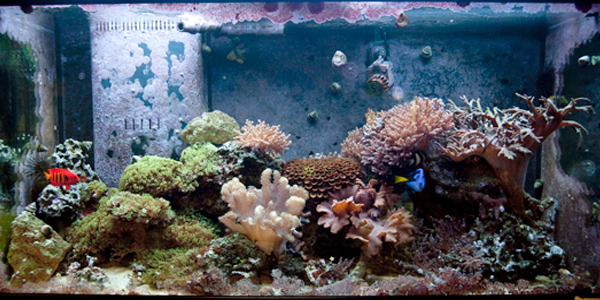 Full tank shot of the Walnut St. Christian School’s reef aquarium. The tank was set up in 2011. Tony had been in the hobby for a while and around this time just upgraded his own system to a 75-gallon tank. He found out about the club by word of mouth and eventually learned about its Tanks in Schools program. Since his son attends Walnut St. it was not long before he began to think about setting up a tank for the school. He was able to find a great deal on a ninety gallon system locally. Walnut Street was one of the first tanks that Flint and the club were able to start up with no initial impact on the wild reefs. 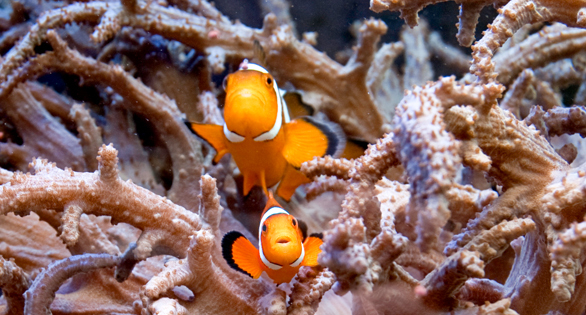 By using mined dry rock that was seeded for several months in the Williamsport High School display tanks and supplying captive-bred clownfish and coral frags the tank was set up with no initial impact on the ocean. The tank itself is simple but successful. It has T-5 lighting, a Bermuda skimmer, and a heater along with a 15 gallon sump. Most of the corals are softies and easy to keep. Fish life includes a pair of captive-bred clownfish, a Royal Gramma, Flame Angel, and Blue Hippo Tang. There are a pair of sea urchins to tackle algae along with some hermit crabs. The system has been up and running for almost two years now and has been stable for quite some time. Classes at Walnut St. have an ocean component to their curriculum and the school uses the tank at all grade levels K-12. They learn about how ecosystems work, about relationships between animals such as symbiosis, and how coral grows. Having the tank in the school provides a wide variety of opportunities for students and teachers. “All the coral came from the club,” Tony is happy to point out. “I think the only things that they didn’t get for us were the two urchins and the Ricordea. Those were donated by someone else. We started out with the clown fish and after the tank was up and running two or three months Larry ordered me the Flame angel and the Royal Gramma. Reef Conservation Society Member Tony Beyer stands next to the reef tank he helps maintain at the Walnut St. Christian School. The Reef Conservation Society continually seeks to build relationships with new school sites and interested partners. 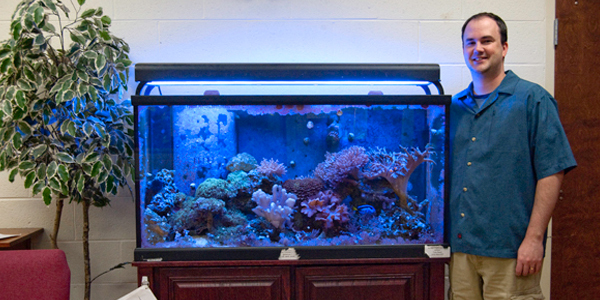 You can view more about the club’s Tanks in Schools program at www.ReefConservationSociety.org.